Blue Sky is an award-winning social enterprise that helps ex-offenders to achieve lasting and transformational change. Ex-offenders are offered 6-month contracts as 'starter jobs', during which they receive help from Blue Sky to find work elsewhere. These starter jobs allow individuals to develop their skills and self-confidence, helping them to find onward employment. It is well-known that having a job is one of the most significant determinants in reducing the likelihood of re-offending. Yet, it is still the case that 75% of prisoners are released to unemployment. This is where Blue Sky comes in. Since 2005, Blue Sky has directly employed over 1,300 ex-offenders (the population of a large prison), with over 40% moving on to permanent jobs elsewhere. And it's working. An independent analysis conducted by the Ministry of Justice's Data Lab has shown that Blue Sky's employment model reduces re-offending by up to 23%, one of the highest performing interventions on record. How does Blue Sky do this? Through two commercial models currently offering job opportunities for ex-offenders at a rate of 175-200 per year. 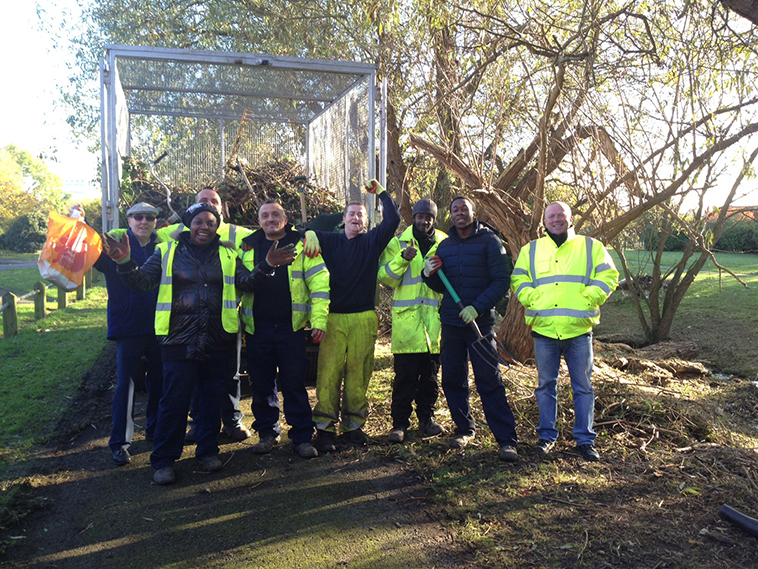 The first of these is Blue Sky Agency, which offers companies an alternative to agency labour in industry sectors such as grounds maintenance and waste management (e.g. major outsourcing service providers such as Amey, Veolia and Quadron), distribution (e.g. River Island) and construction (e.g. Powerday). Contracted to supply labour, Blue Sky recruits ex-offenders to work alongside clients' employees in existing teams, providing support and supervision peripatetically. Blue Sky Agency is currently diversifying and developing new partnerships in industry sector such as food manufacturing, and facilities management. Blue Sky Services, the second commercial model, delivers directly a range of grounds maintenance and related environmental services (e.g. grass cutting, weeding, clearance work, graffiti removal, and jet-washing) to local authorities and parish councils, and also more recently to private companies. 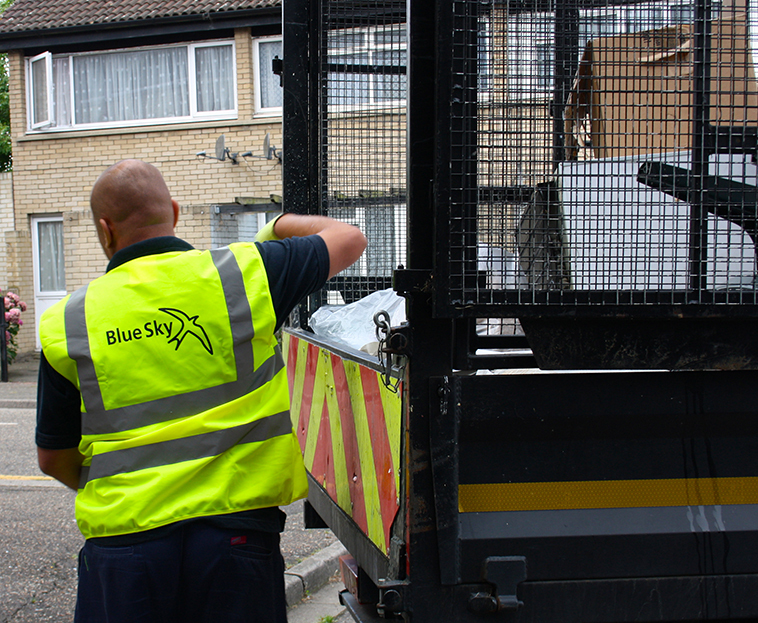 Contracted to supply these services, Blue Sky recruits, employs and directly supervises teams of 4-5 ex-offenders to deliver the work. Wayne was able to get back into work and open up his future thanks to Blue Sky. After joining the British Army aged 17 and serving two tours in Northern Ireland, he witnessed horrific incidents and was diagnosed with Post Traumatic Stress Disorder (PTSD). Although he managed to find work, his PTSD meant that he just couldn't focus. He fell into debt and became an alcoholic, ending up in prison having robbed the local bookies. On release, Blue Sky employed Wayne on a contract with Amey and then helped him get his Driver Certificate of Professional Competence (CPC), a vital stepping stone to a full-time job with Amey. “With the support of Blue Sky I can see the best 'me' that my family are proud of. I have my self-respect back and I am looking forward to a happier future"
Blue Sky aims to help any ex-offender who wants to work regardless of their past. For this reason, Blue Sky jobs are usually 'entry level' – no previous experience or qualifications are needed. Ex-offenders get to work straight away, starting a job on Monday and getting paid on the Friday. As well as a full-time job, Blue Sky offers a package of 'in work' support, from help opening bank accounts to offering training grants; Blue Sky offers ex-offenders up to £300 for vocational courses which help to build credentials for onward employment. Blue Sky is also an accredited training provider, listed on the Skills Funding Agency's Register of Training Organisations (ROTO). They currently deliver work taster sessions and short courses in a number of London prisons and also in the community. Blue Sky is also developing new training courses to meet the needs of their commercial clients and to help bridge the looming skills gaps facing many industry sectors. Inspired by their ex-offender employees, Blue Sky have created their Theory of Change which, through focus groups, surveys and individual interviews with their beneficiaries, outlines the experience of ex-offenders of prison and release, as well as the short-, medium- and long-term changes that they achieve by securing employment with Blue Sky. It also documents both the activities and achievements of Blue Sky, highlighting just how important the work they do is for individuals leaving prison.